Tired of the same old restaurant seating look? You know the one: the square black frame with a metal ladder-back and vinyl seat? Don’t get us wrong, that look is classic and will be around forever; but, the reason it’s a classic is because almost every restaurant has it. 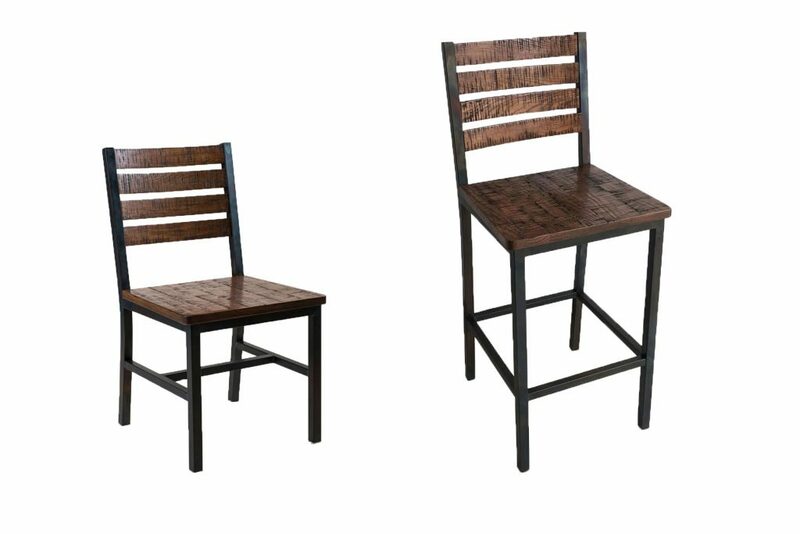 If you want your dining room to stand out from the sea of competition, we’ve got two brand new seating options for you. Clean lines, a sleek black tubular steel frame, and a contoured ash seat are what make the Cooper one of our best looking styles yet. The wide ergonomic seat design with a waterfall edge ensures diner comfort, while the heavy steel frame is built to last in even the busiest dining rooms. 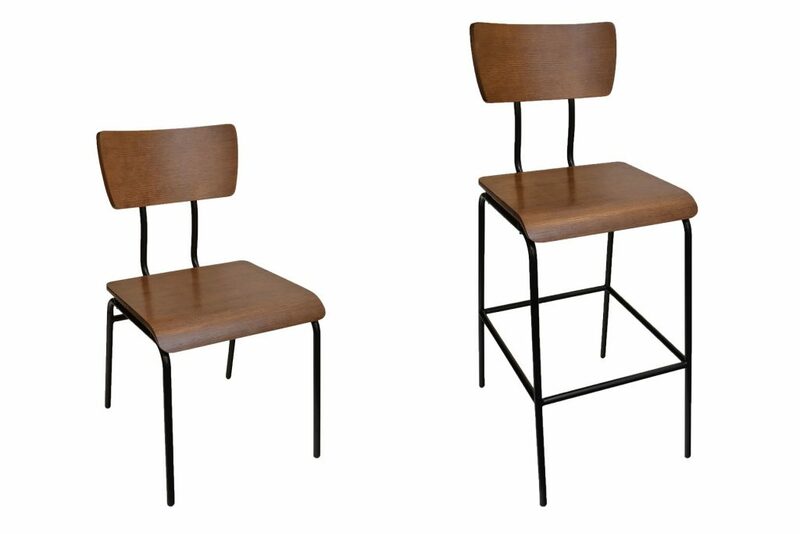 Cooper also features one of the latest hottest upcoming trends in restaurant seating: the round tube frame, which adds a modern minimalist look while maintaining the structural integrity of the chair through the use of heavy gauge steel. Elliot will transport you back to the beginning days of the industrial revolution! Featuring a solid wood seat and weathered iron frame finish, the Elliot speaks to a simpler time when furniture was hand crafted, and was built to last. If you have a rustic concept with reclaimed wood or distressed wood tables, the Elliot is a perfect compliment that adds the industrial flare with its raw steel looking frame. In many cities, restaurant space comes at a premium. So much so, in fact, that many owners have to start with a little less room than they might like. For example, in New York City purchase prices range from $99 a square foot in Queens up to $2,521.00 per square foot in Central Park South. That is a huge difference and has a major effect on how much space an owner can afford. But, tight spaces aren’t necessarily a bad thing. They can create a sense of intimacy and make a business seem more desirable and look busy even with fewer patrons. They also generally keep overhead costs like rent and electricity down, requiring fewer sales to turn a profit. Keep in mind, however, that there is a difference between intimate and uncomfortably cramped. The trick is to take a tight space and make it feel comfortable instead of just jam-packed? We have a few expert tips that can help. Optimizing restaurant space starts from the very beginning. With the very first step of planning the layout it is important to get the ideal front of house/back of house (ie. Kitchen to dining room) ratio. 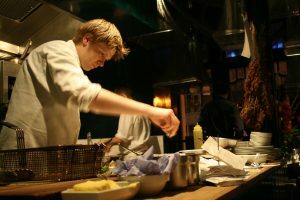 Often owners are tempted to create a large kitchen to service their restaurant. It’s easy to think that you need to allocate plenty of space to the kitchen since it is such a hub of activity. Every bit of extra space that you give to the kitchen is that much less space you have for diners, tables, and the opportunity to turn a profit. The Evans Group, an award winning design firm based out of Orlando, Florida, recommends saving 1/3 of the space for the kitchen and 2/3 for the dining area. Fast-service or banquet service establishments can have smaller kitchens and dining rooms, helping to increase profit from higher sales volumes. These kitchens can occupy as little as 25 percent of the total floor space, for a 4 to 1 dining area to kitchen ratio. Organization is key for a small kitchen; everything should have its place. Shelves and hanging racks are great for conserving counter space by utilizing all available surfaces. Divide the room into stations, so each employee has a designated work space. This will help to cut down on unnecessary kitchen traffic. To make a small kitchen work consider paring down your menu offerings; limiting the amount of items, will reduce the space needed for prep and cooking. There will also be less need for storing different types of ingredients. Also having as much prep done before the rush will making working out of a small commercial kitchen a lot easier. Don’t sacrifice food quality but try to prep beforehand. Owners will have to get creative to save space and work out a system but ultimately the hard work and innovative thinking will be rewarded with added efficiency throughout the business. There are some tricks that you can use to make your restaurant appear larger; the first of which is the color of your walls. Light colors make your walls recede in appearance. This small adjustment can help to make your room seem bigger and having your customer’s feel a bit less claustrophobic. Another way you can use your walls to create space is by putting wallpaper on the ceiling; this creates interest that directs eyes upwards and encourages guests to perceive the ceiling to be taller than it actually is. Try to select wallpaper that matches your overall design. Don’t just put any design on your ceiling in hopes of making the room appear larger but consider the overall atmosphere of the room and choose a paper that ads to it. If you have room on your walls, consider using mirrors to give the appearance of larger room. Use a focal point and angle your mirrors toward it to give the illusion of depth. If you are feeling a bit adventurous try a strip or two of mirrors. Using a mirror across an entire wall can feel confusing. Try to break it down by having strips of mirrors that do the work of expanding the room without reflecting every detail and confusing the eye. Mirrors can also be used to make an asymmetrical room into a symmetrical space which not only creates the illusion of space, but is more pleasing visually. As far as lighting goes, try to keep your light sources off of the tables. 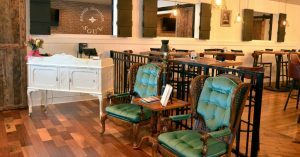 It can crowd the space and make it difficult for patrons to comfortably eat. Instead hang the lights over the tables to create an intimate ambiance. If that doesn’t work using wall mounted lights is also a great space saver. Another creative trend the industry is currently seeing is many businesses using rolling garage doors to add usable space to their design. During poor weather they remain shut while letting in some light. When Mother Nature is a bit kinder, the doors can be lifted to open the space to an outdoor area set up for outdoor dining or just general mingling. With limited space chances are your waiting area will get plenty of use, so try to make it as comfortable as possible. Creating a good flow in this area will help your guests who are leaving the dining room to do so easily, and leave availability for those currently waiting for a table. Creating a comfortable waiting area also helps in terms of customer’s overall experience; you want them happy when they arrive at their tables and not frustrated and looking for a reason to complain. Avoid big couches that will make our space seem smaller in favor of benches or chairs. Try to avoid a bottleneck by having a small bar area where patrons can order drinks and chat while waiting for an available table. The dining room is a restaurant’s stage. A place where all the hard work and preparation comes together to create a master piece created for the customer to enjoy. Don’t let poor furniture choices detract from the overall experience. Just because the dining area isn’t the largest, that doesn’t mean its effect on the customer will be any less inspiring. A few rules of thumb can help you to use your furniture to help and not hinder. Smaller square tables is a good place to start when creating a layout for a restaurant that is short on space. 24”x 24” or 30”x 30” is a good size to start looking at. They offer flexibility in your layout. If most of your customer base is couples on a romantic night out, a smaller table is perfect for that intimate feel. On the opposite end if you have a party of 12 coming in for a birthday celebration, smaller tables can be moved together to create the banquet table you need for that party. Tables should be at least 24-30 inches apart. This allows for not only guests but servers to maneuver comfortably. Cramming furniture together can lead to poor service, which can lead to a poor yelp reviews and decreased traffic. To go along with those smaller tables you will need chairs. Consider chairs that don’t have arms. At the time of purchase it may only seem like a couple extra inches of space to get the chairs with arms but eventually those inches add up. Chairs without arms help to increase flexibility in your overall layout. 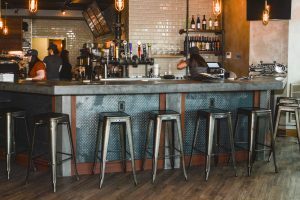 If you are looking to add space at your bar, look into backless bar stools. Don’t have a bar? Bar stools can be paired with bar height tables to save on space. They can be placed closer together without feeling like you are packing your customers in like sardines. Investing in booths can also be a great space saver. You’re thinking, “Those big bulky seats will save me on space?” Yes, yes they will. A booth that seats 4 people will actually take less space than a comparable table and chairs. 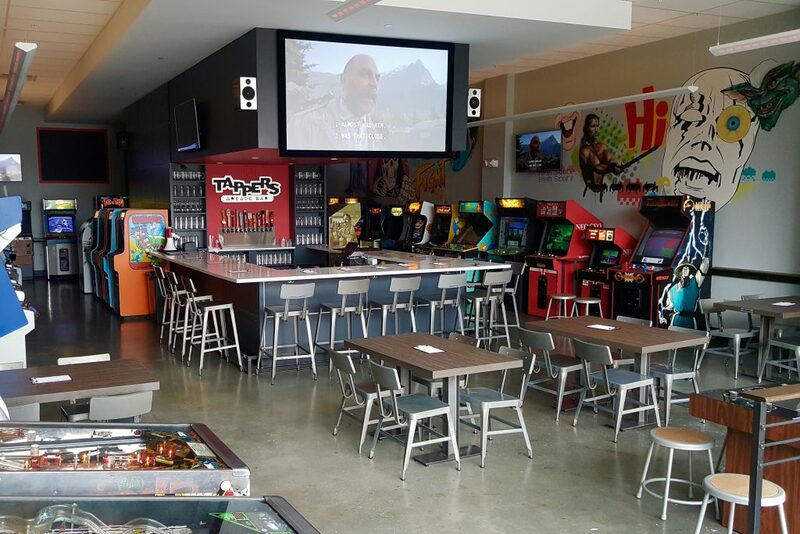 Plus, depending on the number in their party it can give patrons the opportunity to spread out during a business lunch or allow for more relaxation. It also allocates more room for servers. 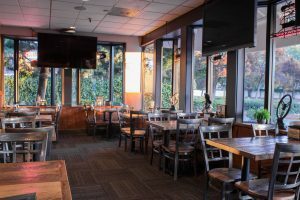 People tend to stay in the area of the booth instead of leaning into aisle ways where busy servers could be rushing to their other customers. 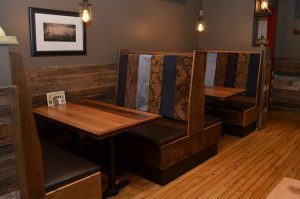 Custom booths can be created to fit the look and layout of your restaurant so that the style flows naturally. As an added bonus, studies show that the average patron spends more while sitting in a booth than at a table. Each customer spends an average of $2.00 more when seated at a booth. Another piece of furniture to consider when designing your layout is the hostess station or a POS system. Do your best not to place it in your dining area. It adds to the look of being over crowded as well as being visually displeasing to patrons. Those stations are often very large and can take up space that could be used for additional tables and seating. One of the most important things to do, but often overlooked, is leave enough space for your servers to easily navigate. It sounds obvious but nothing makes a space seem even smaller quite like having staff that are running in to tables and surroundings all the time. Heaven forbid your staff run into each other and drop their trays or worse. Drop it on a customer. If you have a restaurant in a small space and are having problems, take a look at your layout and design. You may have too bulky of furniture for your area, or not utilizing your space well. Through planning, preparation, and some creative thinking, a small space can be adjusted to be not only pleasing to the eye, but also allow for great work flow. If you’ve ever ordered a piece of furniture with a wood veneer, chances are you were working with Melamine, the ubiquitous plastic with myriad uses from Mr. Clean Magic Erasers to floor tiles. Melamine was first invented in the 1830s by Justus von Liebig, a German chemist who is considered the founder of organic chemistry. It is created by mixing urea, a waste product, with formaldehyde to create a liquid resin that can be molded under high pressure to create virtually any shape. Melamine gained prominence in the early 1900’s when it was developed into molded dinnerware called Melmac. Though Melmac is no longer in existence, melamine tableware is still popular and widely available. In recent years however, melamine has gained a bad reputation due to several unscrupulous overseas companies using it as filler in consumable products like pet foods and baby formula. Even though the resin is considered safe for most uses, when ingested, melamine can lead to severe kidney problems and, possibly, even kidney failure. When used to make furniture, melamine is typically applied as a laminate to particle board or plywood (See the sheets of melamine in the photo above). 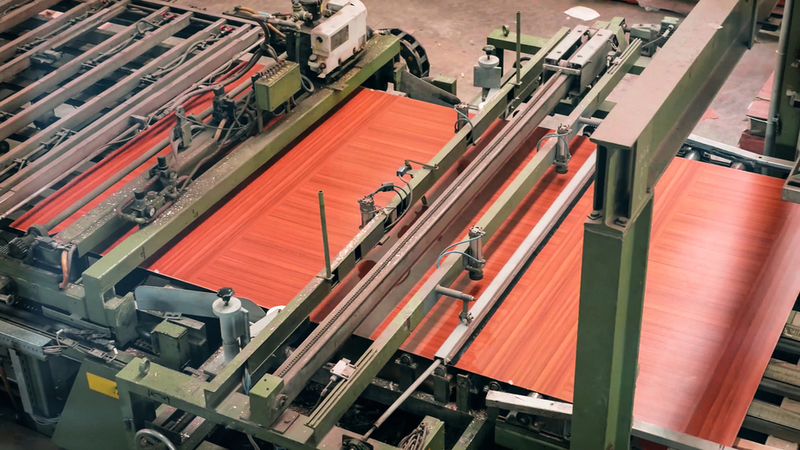 The melamine resin is applied to decorative paper to form a laminate that has superior material properties to the cheaper wood materials underneath it. For example, the laminated material is heat resistant, water resistant, and easily cleanable – all characteristics that are lacking from plywood and particle board. For these reasons, in addition to its low cost of production, melamine is a great choice for commercial furniture like restaurant tables and office desks; it is also great for cabinetry and bedroom coffee tables. Happy Columbus Day! Whether you’re enjoying a sales event or a day off, the time period of Columbus is certainly a defining, historical series of events that many people don’t know a lot about. We’ve rounded up some fun facts for you (or your next go at being on Jeopardy) about the holiday and the furniture of the time. Christopher Columbus was not the famed explorer’s real name; it was closer to Cristoforo Colombo. Columbus’ trip coordinated with what is said to be the beginning of the Spanish Renaissance that lasted until the early 18th century. Many paintings of Columbus were not actually of him; most were painted after his passing in 1506. Christopher Columbus landed in the Bahamas (not the East Indies, oops!) on October 12, 1492. Most people at the time of Columbus knew that the Earth was not flat, but weren’t aware of the other continents “in the way” of the East Indies. Spain was not Columbus’ first choice for sponsorship; England, France, and Portugal all said no. After his primary voyage to the New World, Columbus made 3 trips back to his colonies there. Columbus Day is not celebrated in 22 states because of its controversial history. Columbus Day was proclaimed a national US holiday by President Franklin D. Roosevelt in 1937. Spain was in its political prime, controlling southern Italy, Portugal, the Netherlands, and now, New World colonies as well. 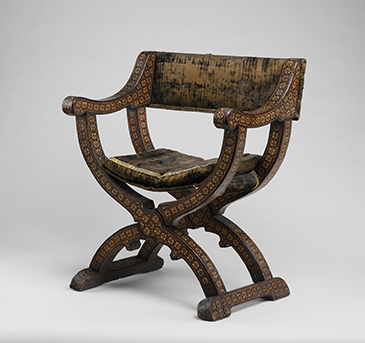 Renaissance furniture design was inspired by Greek and Roman antiquities, especially in Italy. 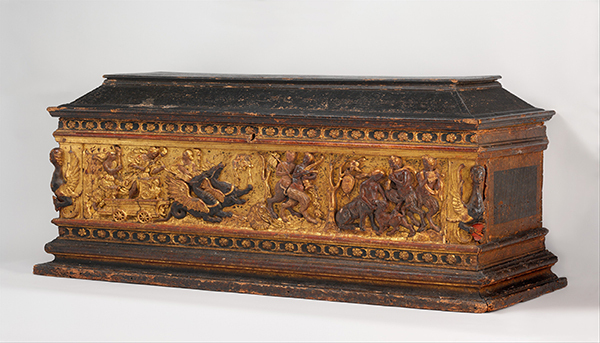 The cassone chest became one of the most recognizable furniture pieces of this time period with its intricate carvings or gilded decorations. Much of what is depicted on Renaissance furniture comes from mythology or history, separating it from the Gothic styles that pulled from the lives of saints. Cabinet and furniture makers of the time began to use more lustrous woods like walnut. 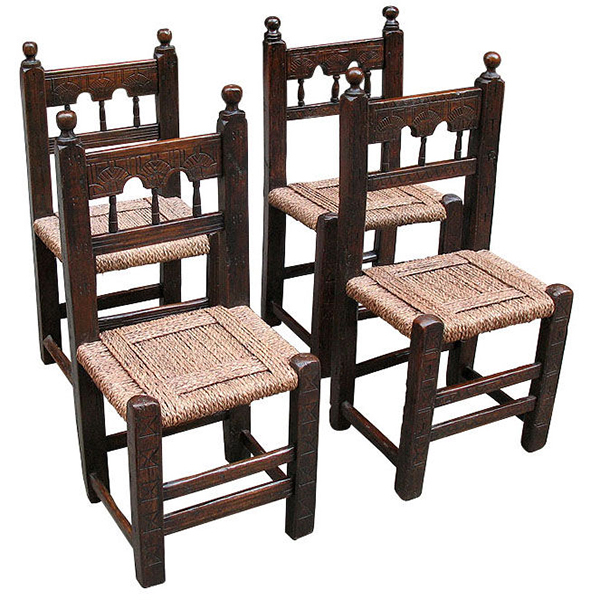 High back chairs were all the rage throughout European countries because of their throne-like appearance. Columbus Day is celebrated in many ways around the country including food festivals, retail sales, or the replacement of Indigenous People’s Day. Regardless of what you’re celebrating on this brisk October day, have a safe holiday! Let us know in the comments below how you plan on spending the day.